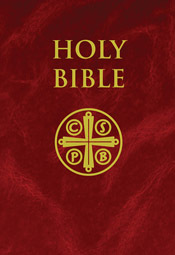 Official Release Date: Ash Wednesday, March 9, 2011.Saint Benedict Press is a proud publisher the New American Bible: Revised Edition (NABRE), the first major update to the New American Bible (NAB) text in 20 years. After years of scholarly labor and review, the NABRE is approved for publication by the USCCB for release in a variety of formats on Ash Wednesday, March 9, 2011. The NABRE accomplishes three major goals in Biblical scholarship: First, a more accurate translation aided by modern archeological and historical discoveries; second, a more consistent rendering of the Greek and Hebrew to more closely express the meaning of the original text; and third, revisions in the NABRE reflect changes in modern English usage of particular words (ex. burnt offering substituted for holocaust ). Saint Benedict Press is debuting the New American Bible: Revised Edition (NABRE) in three handsome editions Black Premium UltraSoft, Burgundy Hardbound, and Quality Paperbound. Each includes extensive notes, commentary, cross-references (a first from Saint Benedict Press! ), a 3-year cycle of readings for Sunday and weekday Masses, and favorite Catholic prayers. By: Rev. Fr. Marie Dominique Philippe, O.P.